Almost every fish eater I know loves red snapper. It's funny that I didn't know the correct name for this fish until I was an adult. Where I grew up, it was simple called "red fish"... oh well... you live, you learn right?! Rinse fish under cold running water and pat dry with paper towels. In a small bowl combine lime juice and water; brush onto fish. Remove from oven and brush the fish with pan juices. 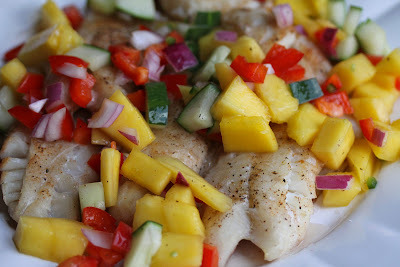 Top with Mango Salsa and Serve! yes please do let me know how it turned out!